As writers, translators, and editors, most of us feel confident both writing in our native language and repairing other people’s clunky prose; the click of words falling into their proper places becomes, over time, as unmistakable as it is satisfying. Venture into a foreign language, however, and the process is not so pleasant—at least for me. Although I’ve been speaking, reading, and working in Japanese for quite a while, writing in it still feels akin to cooking left-handed. I know what to do, but there’s always a lurking fear of failure and awkwardness. Oftentimes this fear is justified. I vividly remember the time I sent off an introductory email in which I meant to write 〜と申します, only to realize after the fact that I had mistakenly written 〜とも押します。Ah, first impressions. I don’t doubt that over the years I have made many other embarrassing errors without even realizing it. Back when I lived in Japan I often asked native-speaking friends or family members to have a look at work-related emails before sending them. Now that I am in the United States, I’ve found I need other sources of help. Reference books are one lifeline. Writing E-mails in Japanese (The Japan Times, 2005) is an old favorite with dozens of templates for various situations, as well as suggestions about level of politeness, appropriate closing lines, and other quandaries. The chapter on business email is especially useful, as is the list of phrases for making a request. 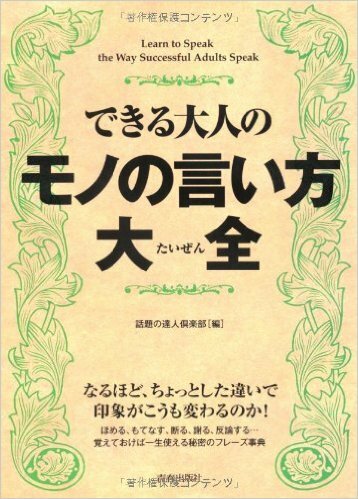 I recently picked up another volume called できる大人のモノの言い方大全: Learn to Speak the Way Successful Adults Speak (Seishun Shuppansha, 2012), which is a hefty dictionary of polite phrases for every imaginable situation (compliments alone, for instance, merit 51 pages). Because it is aimed at (linguistically incompetent) native speakers, the explanations are in Japanese, but they are written in an easy-to-understand style. This month, I’ve also been experimenting with an online resource called Lang8, a free website where users can post “journal entries” in a foreign language and have them corrected by native speakers. As is typical of social networking sites, Lang8 requires nurturing to be of any use; you earn points by correcting other people’s entries, and these points help attract viewers to your post so that it’s corrected more quickly. The company that runs the site is based in Tokyo, which may explain why it has over 280,000 Japanese users. This is a definite plus for those of us who want Japanese compositions corrected. The company also offers an app for smart phones called HiNative, although I haven’t tried it. So far my experience using the website has been positive. I’ve done five edits and received five back on two entries, both within several hours of posting. One entry was a self-introduction, and the second was a sentence I’m planning to include on my revamped website. I originally wrote “Please don’t hesitate to contact me at info@winifredbird.com. 日本語での連絡もどうぞ！” One user suggested I write　日本語での連絡も大歓迎です; another suggested日本語での連絡もお気軽にどうぞ. Both struck me as good ideas, but I’m not yet sure how consistent the quality of feedback is. I’ve noticed in reading through English journal entries that unnatural sentences are often marked “perfect” by other users, which suggests that they are either poor editors, non-native speakers, or leery of hurting the feelings of their fellow writers. For this reason, it’s probably best not to rely on Lang8 to polish any critically important piece of writing—for that you should go to a trusted human, or a paid translation service.